“Chris Burden: Extreme Measures” is an expansive presentation of Chris Burden’s work that marks the first New York survey of the artist and his first major exhibition in the US in over twenty-five years. Burden’s epoch-defining work has made him one of the most important American artists to emerge since 1970. Spanning a forty-year career and moving across mediums, “Extreme Measures” presents a selection of Burden’s work focused on weights and measures, boundaries and constraints, where physical and moral limits are called into question. 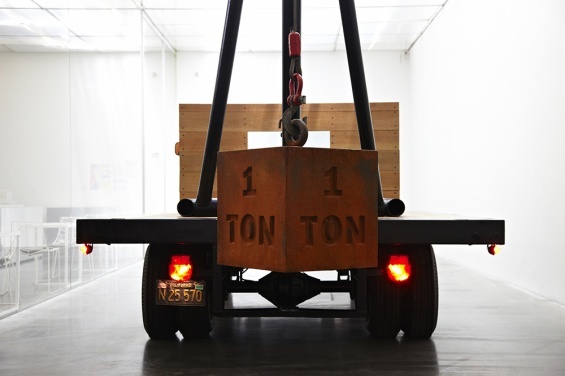 “Chris Burden: Extreme Measures” is organized by Lisa Phillips, Toby Devan Lewis Director, with Massimiliano Gioni, Associate Director and Director of Exhibitions, Jenny Moore, Associate Curator (until July 2013), and Margot Norton, Assistant Curator. Chris Burden currently lives and works in Los Angeles. He attended Pomona College and received his MFA from the University of California, Irvine, in 1971. He had a major survey exhibition at the Newport Harbor Art Museum, Newport Beach, CA, in 1988 and at MAK–Austrian Museum of Applied Arts, Vienna, in 1996. His work was presented in the 48th Venice Biennale and at the Tate Gallery in 1999. In 2008, the Public Art Fund presented WHAT MY DAD GAVE ME, one of his skyscraper sculptures, at the Rockefeller Center in New York City. “Chris Burden: Extreme Measures” is made possible through the lead support of the Henry Luce Foundation. Major support is also provided by The Andy Warhol Foundation for the Visual Arts, Lonti Ebers and Bruce Flatt, Gagosian Gallery, and the National Endowment for the Arts. Generous support is provided by the Broad Art Foundation, Santa Monica, F.J. Sciame Construction Co., Inc., the Jacques and Natasha Gelman Foundation, LLWW Foundation, Eugenio López, Catriona and Simon Mordant, Nicolas Berggruen Charitable Foundation, Aby and Samantha Rosen, and Åke and Caisa Skeppner.